Ably provides two models for delivering push notifications to devices. Channel-based broadcasting provides automatic fan-out capabilities for push notifications, and direct publishing provides a means to deliver individual notifications to devices. 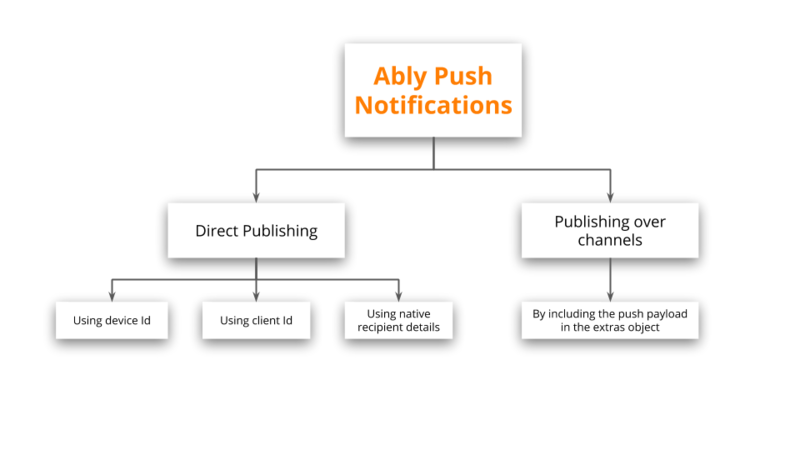 The model for delivering push notifications to devices over channels is intentionally very similar to how normal messages are delivered to realtime subscribers using Ably’s pub/sub channels. For example, a normal message published on an Ably channel is broadcast immediately to all subscribers of that channel. When broadcasting push notifications on channels, however, the process is the same with the exception that the subscribers (devices receiving push notifications) are registered in advance using our API and the message itself must contain an extra push notification payload that specifies the optional visual format and optional data payload of the native push notification. Push notifications are sent as special payloads alongside a normal Ably message in the extras field. The extras field is an object and must contain a push attribute object with the push payload details. @"body": @"Example push notification from Ably." "body": "Example push notification from Ably." Devices identified by their native recipient attributes such as their unique registrationToken in the case of GCM, deviceToken in the case of APNS, or targetUrl and encryptionKey in the case of a Web device (experimental). This is particularly useful when migrating to Ably with existing push notification target devices. See the push admin publish documentation for the client library API details, and the raw push publish REST API documentation for information on the underlying direct publishing endpoint used by the client libraries. Override the generic value for that field. Add specific fields that are not supported in the generic structure. web, for Web Notifications (experimental). "title": "Hello to iOS from Ably!"